Quake Up! is first and foremost preparing the individual, family and neighborhoods of Washington County to better manage in an emergency and/or a disaster situation. NorthWest Prepared is focused in a coordinated, comprehensive approach to prepare and strengthen our resilience from an emergency or disaster and make possible our ability to recover on every level – personal, neighborhoods, businesses, cities, counties, states and region wide. This is the ‘Bounce Back Faster From Disaster’ slogan we have adopted. Why not have an earthquake simulator that could be taken up and down the Oregon coast 101 Highway and the 5 Freeway to schools, businesses, emergency/disaster preparedness events, etc.? The Shakey-Quakey program is to teach our kids about earthquake safety. These highly-specialized earthquake simulators were designed to educate children about how to prepare for and stay safe during an earthquake in a way they can understand as well as share with family members. Last year it was set up in Westlake Park and was brought in as part of an awareness event by the Seattle Office of Emergency Management. Learn how to get more actively involved in Washington County, Oregon's emergency preparedness movement as Eric D. Schmidt interviews Quake Up - NW Prepared's Stan Houseman and Pat Wolter on this episode of City Talk. 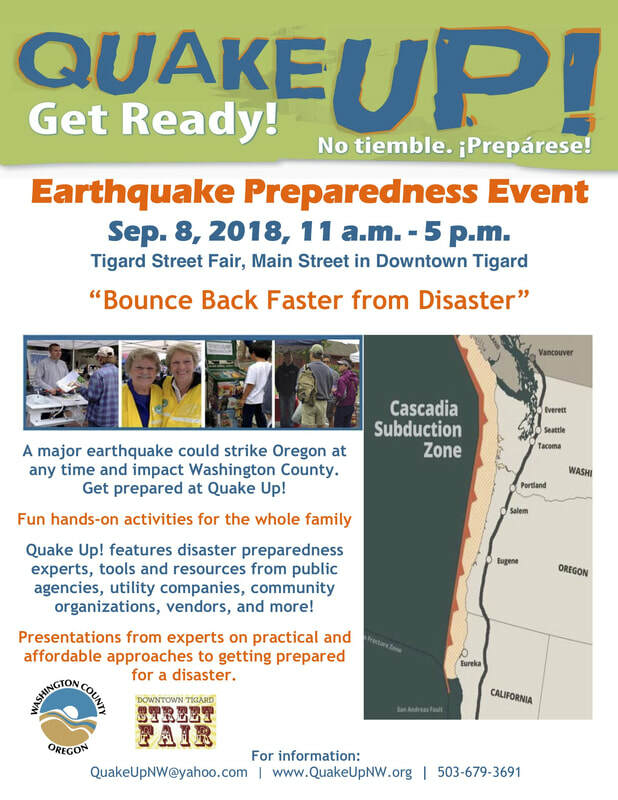 On Saturday, September 8 at the 2018 Tigard Street Fair, Quake Up! 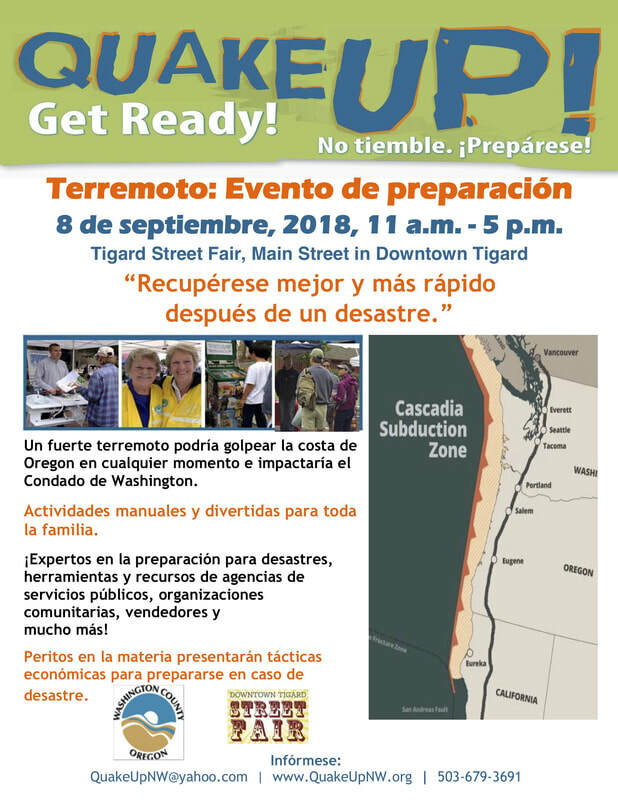 will connect attendees with educators, emergency responders, government agencies, local volunteer groups, and private-sector companies who offer information and resources that will assist people in surviving the earthquake. Our Quake Up! 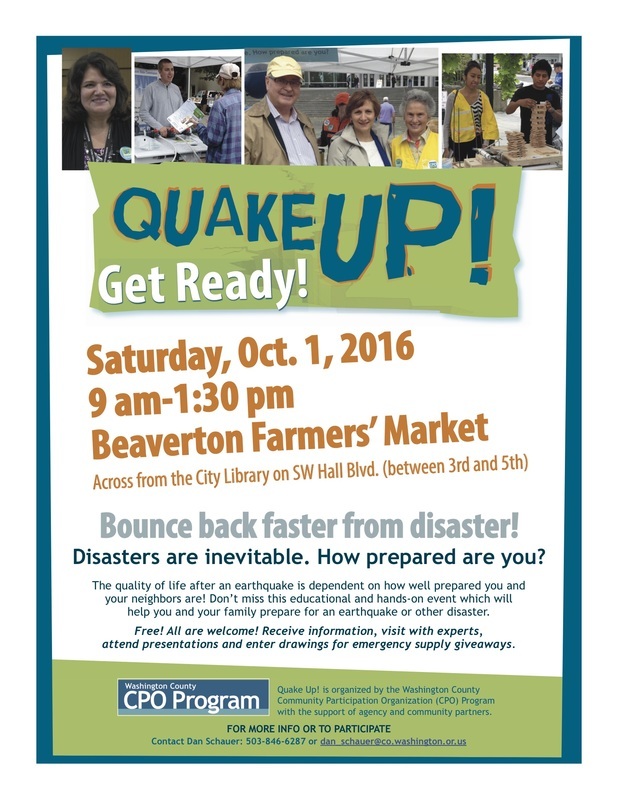 vision is for a Washington County community that is united and resilient to a Cascadia Subduction Zone earthquake. Where: Tigard Street Fair – Main Street from SW Maplewood Drive to SW Commercial Street. 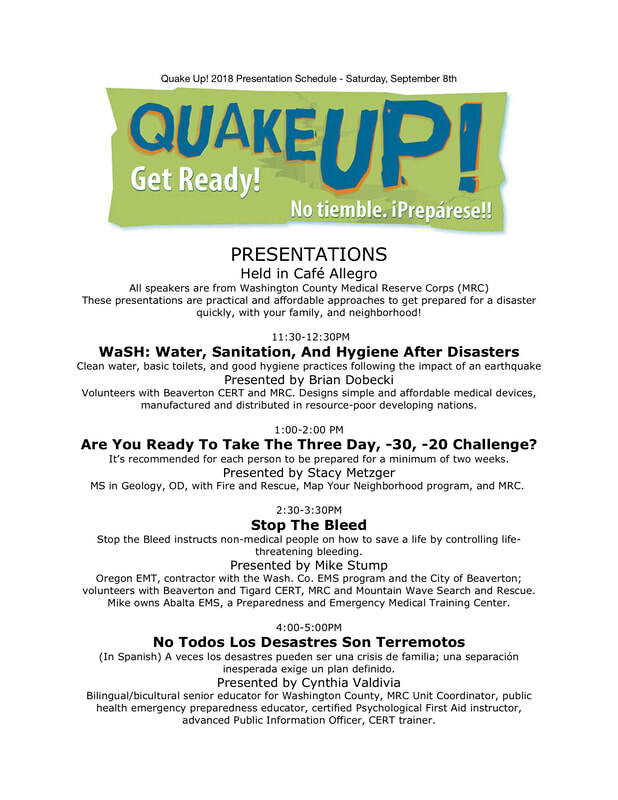 Cynthia Valdivia - Not All Disasters Are Earthquakes (Presentation in Spanish) - 4:00 p.m.
​We are seeking volunteers to take over some of the positions from our wonderful, but retiring members. Please inquire to help others become emergency/disaster prepared. Thanks! ​"Hurricanes, wildfires, earthquakes and floods strike communities every year, injuring and displacing thousands. A plan and an emergency kit are important, but they only go so far. Ideally, your whole community should be ready, and if you don’t think it is, here’s how you can help make sure." The Quake Up! 2017 Event was another success with fantastic speakers (which were all recorded by TVCTV), our many partners and vendors who helped by providing great advice, materials and elaborate demonstrations and exhibits. ​A big thanks to our supporters, the Hillsboro Farmers Market, Washington County Emergency Management and Public Health-Emergency Preparedness Departments. ​A Special Thank You to our many Volunteers which without them, this would not happen at all! Plan. Prepare. Practice. Quake Up! 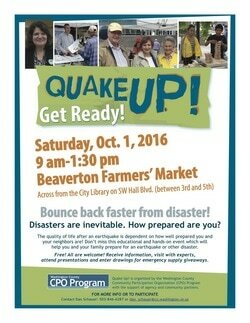 PRESENTATIONS - 2017 Washington County Quake Up! CHECK OUT THE VIDEOS FROM TVCTV! Quake Up! 2017 event is set for the Hillsboro Farmers Market again on October 7th, 2017. We are excited to return to our original venue and look forward to having you join in and help the people of Washington County to become better prepared with their families, friends and neighbors. From our last two years events, all together, we have given out 1,000s of pieces of information in regards to emergency and disaster preparation. Many have seen hands on demonstrations and exhibits. 100s have heard from speakers ranging from prevention, mitigation and resilience. Beyond the event itself, both NEWS channels and TVCTV recorded the actual event and participants and also, the speakers which are still aired to this day. Our many partners from the county and utility companies are available to talk about and showcase their projects recently completed, currently working on and near future starting - to make Washington County able to withstand this massively destructive earthquake. Our local business partneres will provide information and essential pieces of equipment, products, services to help families be prepared and able to 'Bounce Back Faster from Disaster'. The Quake Up! Team is made up of unpaid volunteers from across Washington County. ​We come from varying backgrounds and experiences and mostly we have worked together on this event from caring about our communities in the county. Quake Up! received County CPO funds in both years. • 15 community volunteers put in an estimated 550 unpaid hours in the first year. We have been holding monthly meetings since last years event ended with how to improve the experience of the participants; better networking with schools, businesses, churches; increase news media coverage, and more. Quake Up! has proven to be a great way to get information out to Washington County communities in regards to emergency and disaster preparation. September is recognized as National Preparedness Month (NPM) which serves as a reminder that we all must take action to prepare, now and throughout the year, for the types of emergencies that could affect us where we live, work, and also where we visit. Due to the success of last year’s theme, “Don’t Wait, Communicate. Make Your Emergency Plan Today,” will be returning for this September with a continuing emphasis on preparedness for youth, older adults, and people with disabilities and others with access and functional needs. Thank you for taking time help make America more prepared for emergencies. Honor 9/11 by Getting involved in your community and planning with neighbors. Take individual steps to prepare for a disaster today like downloading the FEMA app. 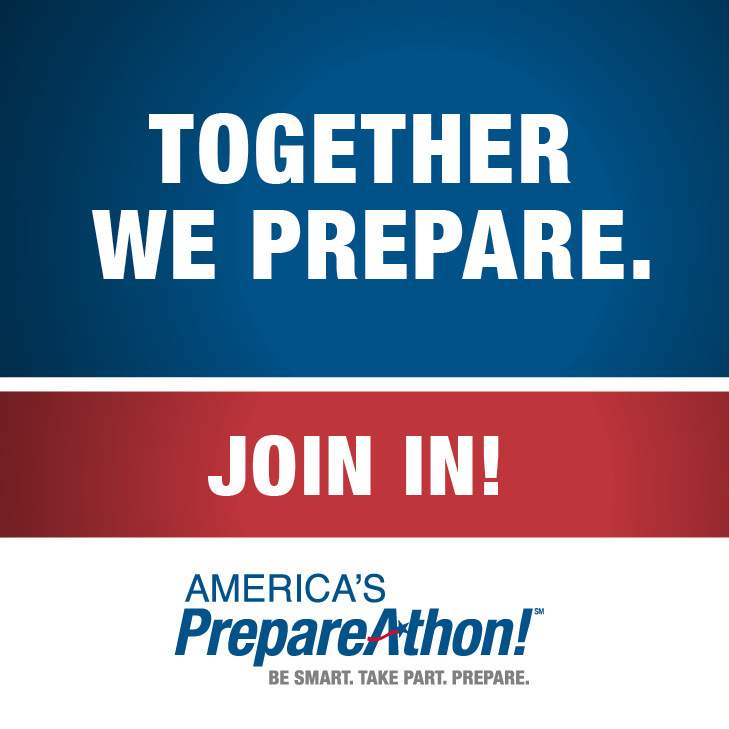 Be counted and register your preparedness event for National PrepareAthon Day! There are many ways for individuals, businesses, schools, faith-based organizations, community groups, scouts, and others to participate in the ShakeOut, to get prepared for earthquakes, and to share what you're doing with others so they can do the same. Registration totals from Great ShakeOut Earthquake Drills across the U.S. are also included in America's PrepareAthon! participation totals.